You can spend a lot of money on a tent these days, with many styles—especially ultralight models—running well north of $300. But plenty of less expensive tents are available that sacrifice none of the functionality of pricier models. Here are three excellent models to consider. For this round-up, I’ve narrowed the criteria to two-person tents that feature a to-the-ground rainfly, a packaged weight of around 5 pounds, and a price tag of less than $250. A couple of things are worth noting. First, most of these tents cost less because they use less expensive materials. In particular, few tents in this price range feature silnylon, that slippery, lightweight, and pricey fabric that has become all but ubiquitous in higher-end models. Instead they feature more standard nylon or polyester fabrics that cost less, but weigh more. With two doors, a simple two-pole design, ample interior room, and a nearly unbeatable price point, the REI Passage is hard to top. Modeled after the original REI Half Dome from more than a decade ago, its design is tested, proven, and up to nearly every form of three-season weather (as I can attest with more than 100 nights out in all conditions with my original REI Half Dome). 5 pounds, 5 ounces. With a minimum trail weight below four pounds (packaged weight not listed), this is one of the best deals on an ultralight tent. Its low-profile hub pole design offers structural strength while providing two large doors on either side that span almost the entire length of the tent. A low peak height (only 36 inches) is perhaps its only drawback. 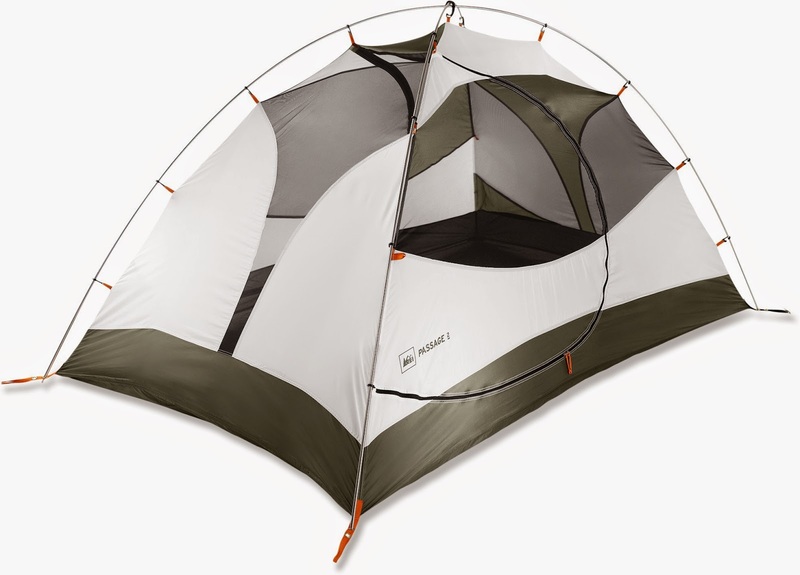 This roomy tent features a modified two-pole design with distinctive “knees” at the corners. The poles’ slight kink creates more vertical space and creates a greater sense of internal space, even though the tent is a bit shorter with only an 88-inch length. A short cross-pole pushes out the sides as well, further enhancing this effect. 5 pounds, 4 ounces.